Deformed nails can be painful, ugly and embarrassing. They can become so thick that they are difficult or impossible to trim yourself. A deformed toenail is often caused by an injury to the nail or from pressure against the nail from a toe that has become bent, contracted or rotated. A thick, deformed toenail often needs to be permanently removed. This is a simple office procedure that can be done on your initial visit. Once healed, there may be a thin layer of skin that looks quite normal with just an outline of the toenail. This can then be covered with toenail polish if desired. Many diabetic and elderly patients, especially those with poor circulation often have very thick and deformed toenails that they or family members are not able to trim. These nails can not only become painful, but become a source for sores, ulcerations or infection. 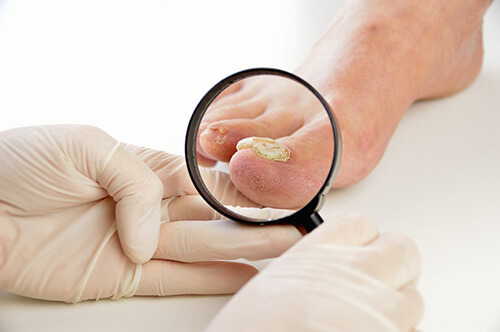 If health and/or circulation problems prevent permanent removal of a deformed toenail, then we can provide professional toenail trimming and filing (palliative foot care), typically on a regular 2-4 month cycle and often covered by insurance. If you are having problems with deformed toenails then an appointment is necessary with Dr. Silver at the Westwood Foot Clinic in Golden Valley, MN to determine the ideal treatment to get your toenails looking and feeling healthy again. Don’t delay treatment any longer! Call the Westwood Foot Clinic in Golden Valley, MN, today at (763) 231-2341 for an appointment with Dr. Silver. Same and next day appointments are often available!